We carry out a full physical exam and health check as part of your pet's annual vaccination, recommended for all dogs, cats, and rabbits. Regular health checks allow us to be proactive in keeping your pet healthy and allow us to identify potential problems at an early stage. Dogs can be neutered from 6 months of age; cats and rabbits from 4 months. 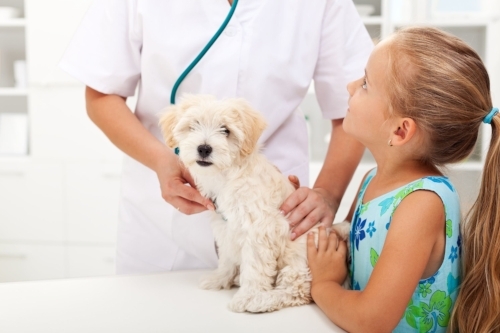 Neutering can have health benefits for your pet and prevent unwanted litters. There are also alternatives to surgical neutering so please contact us for advice. Microchipping is a popular and permanent way of identifying your pet. A small microchip is inserted under your pet's skin, which can be scanned if your pet is found and brought to a vet or rescue shelter. This will give your pet the best chance of being reunited with you should the worst happen and he or she becomes lost. Should you wish your pet to travel abroad with you, we can provide you with pet passports and general advice on travelling abroad with your pet. House visits can usually be arranged, when necessary. However, for unwell pets, it is usually better if they can be brought to the surgery promptly, where they will have full access to medical and surgical treatments. We have modern computerised x-ray on-site and will have your pet's x-ray results the same day they are done. Initial blood testing to test for the most common conditions affecting your pet can be done in-house, with same-day results. Some blood tests may require to be sent to an external laboratory and so may take a little longer. We have modern operating equipment allowing us to perform most surgeries, including neutering, within the practice. There is always a trained member of staff to help monitor your pet's anaesthetic and recovery. Our comfortable and large kennels ensure your pet recovers in warm, cosy surroundings. We can provide you with prescription diets if your pet requires a special diet for a medical condition. Most brands can be ordered for you to collect at the surgery. The Lomond Vets Care Plan is designed to help you budget for these routine treatments by spreading their cost throughout the year with a monthly direct debit. All members also qualify for additional discounts on other items in the practice, such as clinical diets. The plan is available for dogs, cats and rabbits.